​What is the Mindful Walking Method and what makes it so special? Founder of the Inner Health School of Taijiquan, Adelaide, John Hartley explains. John, IHT officially launched the Mindful Walking Method in April 2017 with a two-day workshop in Adelaide, South Australia. Can you explain what is behind this method that you have developed and why it is so important? John: The Mindful Walking Method is one of what we call our Gateway Practices. These practices are built upon core Taijiquan principles and have been designed to take us beyond simply imitating movement, into feeling our practice more deeply. Taijiquan is a profound art and there is so much more below the surface than what is expressed through mere nice-looking movement. Having sound foundations is the gateway to fulfilling the promise that is Taijiquan. We implant these foundational principles through a series of Mindful Walking Method modules that include both standing and stepping practices, that have been collated during some 40-plus years of personal study and practice of Taijiquan and related Taoist health sciences. How do you teach this method in a way that makes the internal development ideas accessible to people of all ages? 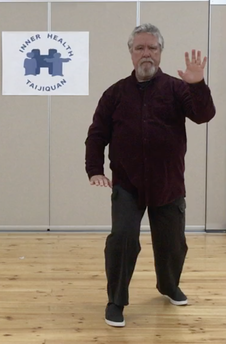 John: These modules are presented in a simple and straightforward manner, but I have ensured that they are consistent with core Taijiquan principles, including the 13 dynamics, balanced openings and closings, and that all preliminary practices, body methods and nei-gung elements remain consistent. We teach one module per workshop, to ensure there is time for personalised one-to-one instruction and participants can start to integrate the principles into the body. Once learnt, the Mindful Walking Method can be practiced as individual modules or as a complete integrated set with in-principle transitions between each module. ​During the long development of the Mindful Walking Method I have found that it can be very beneficial for students in developing greater body awareness, balance and stability. I believe it is an excellent means for rejuvenation, increasing vitality, and bettering ones overall health and wellbeing. Seeing food, hearing about food is different from eating food. Taoist practices are about direct experience. Once you have felt the practice in your body you will go "Ok, now I know". ​The way you teach the Mindful Walking Method is a very hands-on way of learning. John: Yes, at the Adelaide workshop we had IHT's senior instructors together from South Australia, NSW and Tasmania. Collectively our instructors have in excess of 80 years’ experience of doing taijiquan and related practices, and have worked intensively on this method and how to teach it. ​Our way of instruction is clear and personal and designed to focus on integrating and embedding core Taijiquan principles into the body of one’s practice. We present it in such a manner that it can be applied to all Taiji practice forms. In fact, our Mindful Walking Method can be practiced as adjunct to anybody's existing daily practices or as a stand-alone method of practice that is complete in itself.